Each tablet contains Praziquantel, Pyrantel Pamoate and Febantel. Indicated for removal of Ascarids, Tapeworms, Hookworms and Whipworms in Dogs. 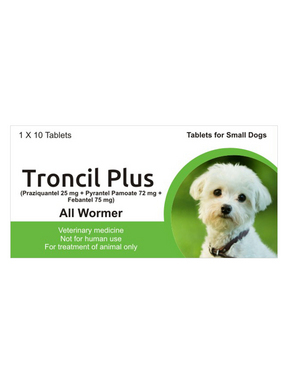 Troncil Plus for Dogs (Praziquantel/Pyrantel Pamoate/Febantel) broad spectrum anthelminthic tablets are available in three sizes. Each size is scored for convenient oral administration. CompositionEach Troncil Plus Tablet for Puppies and Small Dogs contains 25 mg praziquantel, 72 mg pyrantel pamoate and 75 mg febantel. Each Troncil Plus Tablet for Medium Sized Dogs contains 50 mg praziquantel, 144 mg pyrantel pamoate and 150 mg febantel. Each Troncil Plus Tablet for Large & Extra Large Dogs contains 175 mg praziquantel, 504 mg pyrantel pamoate and 525 mg febantel. IndicationsTroncil Plus Tablets are indicated for removal of tapeworms (Dipylidium caninum, Taenia pisiformis, Echinococcus granulosus and removal and control of Echincoccus multiocularis). For removal of hookworms (Ancylostoma caninum, Uncinaria stenocephala), Ascarids (Toxocara canis, Toxascaris leonina) and Whipworms (Trichuris vulpis) in dogs. Not intended for use in puppies less than 3 weeks of age or dogs weighing less than 2 lbs. Contraindications, WarningsConsult a veterinary surgeon before treating pregnant animals for roundworms. Storage: Troncil Plus Tablets should be stored at controlled room temperatures between 59-86?F (15-30?C). Heartworm from Joe's for many many years and I wouldn't buy anywhere else. The Generic Drontal dog wormer is an EXCELLENT product--it's easy to administer, works efficiently, and Joe's Pet Meds offers the product at the best price(s) I've seen. Drontal was recommended as the wormer of choice when we took our newly rescued/adopted Chocolate Lab to her first vet appointment due to the broad spectrum of coverage. However, our vet warned of the cost. Joe's Pet Meds offers this wormer at a fraction of the cost! When comparing prices from my vet's office, I get FOUR TIMES the amount of dosages from Joe's with the same effectiveness! Our dog's coat is beautiful, and I have confidence (that was also confirmed at her check-up) that she is worm free. Thank you Joe's Pet Meds! I'll certainly continue to be a repeat customer! Can't always keep my 4 cats totally flea free 24/7 and these tabs are good quality and rid them of worms they get from occasional flea ingestion and other sources--effective and price-friendly! We raise Boston Terriers and French Bulldogs, after using panacur and stringid over and over with no results a friend gave us a link to JoesPetMeds to buy this Generic Drontal and not only is the price amazing but it has been the only thing to truly clear our puppies of those nasty worms. Thanks JoesPetMeds!!! So glad that I found this product for my dogs. It is what I was looking for and was offered at a great price. It is a very helpful med for the old people like me who cant afford much.